The healing quality of light has been understood for centuries. Light therapy for use in skin healing processes has its foundation in the work of researchers such as Tiina Karu. Trials have clearly displayed that 633 nm light enhances not only DNA synthesis, but also augments cellular tissue regeneration pathways including collagen deposition. Light at 830nm is known to stimulate tissue remodeling cell lines and influence remodeling & restructuring of collagen. Study groups have shown that near Infra-red light (830nm, Omnilux plus™) combined with 633nm, Omnilux revive™ red light accelerates the wound healing response and therefore offers an effective treatment for the healing of compromised tissue. Omnilux revive™ biomodulates fibroblast activity, leading to faster and more efficient collagen synthesis. Omnilux plus™ stimulates the contractile phase of the remodeling process producing better lineated collagen. In combination these wavelengths work in synergy to produce better visible results and hence patient satisfaction. In a recent independent study 83% of all subjects reported a softening of fine lines and wrinkles after a course of Omnilux plus™ and Omnilux revive™ combination therapy. Over 75% reported a marked improvement in skin softness and smoothness. Digital profilometry supports the subjective responses with significant improvements in skin roughness and wrinkle depth. Study groups have shown that near infra-red light combined with 633nm red light accelerates the wound healing response and therefore offers an effective adjunctive therapy, pre and post laser surgery and post surgery. Dr Mario Trelles Instituto Medico Vilafortuny , Cambrils, Spain uses Omnilux revive™ and Omnilux plus™ in his blepharoplasty and mammoplasty procedures, recognizing the benefits of red light. 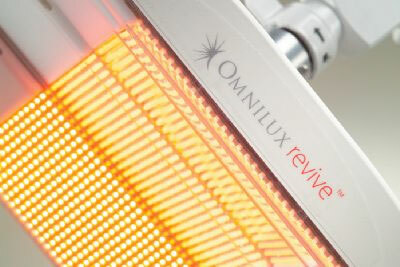 At Omnilux™ we strive to understand how light therapy works in synergy with our bodies’ own natural mechanisms. 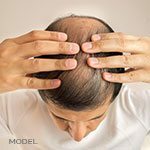 As we grow older, the cells that manufacture the skins supportive structures begin to slow down. 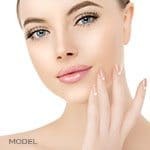 Environmental damage from the suns rays speed up this process and produce free radicals that damage the skin and the cells that synthesize collagen and elastin. 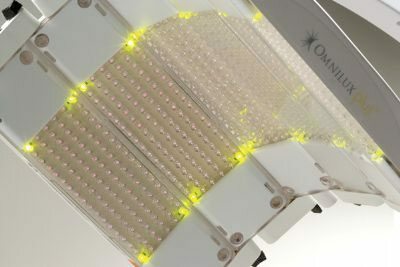 What is Omnilux™ combination phototherapy? Omnilux™ uses a combination of pure, visible red light and invisible infra red light to stimulate the deeper skin tissue, leading to a softening of fine lines, improved skin tone and super smooth skin. Omnilux™ combination phototherapy works with the body’s own natural processes to counteract the effects of ageing.The different lights target specific cells which are responsible for the synthesis and repair of the skin’s supportive structures. The scientifically designed light source does not contain harmful UVA or UVB.You will experience a feeling of relaxation and well-being during and after the treatment. This depends upon your individual treatment régime. Your aesthetician will advise you on how many treatments may be suitable for your particular needs. This will vary according to skin type and lifestyle and whether you have combined Omnilux™ with other treatments. However, unlike other treatments where the effects are short lived, Omnilux™ light therapy stimulates natural cellular processes that rejuvenate skin. This means the results you see with Omnilux™ continue to improve for up to 4-6 months after the light treatment. Who is Omnilux™ combination phototherapy suitable for? Because Omnilux™ Combination Phototherapy stimulates cells involved in repair of the skin and increases blood flow, it has been used successfully to enhance and improve other aesthetic treatments. Omnilux™ Combination Phototherapy can be used before (to condition the skin) and after (to speed up the healing process) a number of popular aesthetic treatments. Omnilux™ Combination Phototherapy greatly reduces the side effects and speeds up the time your tissue takes to regenerate. This means that you recover much quicker and the overall response is improved.